It’s a great time to start planning your winter vacation to Stowe, VT. Soon the snow will be falling, the mountains will be covered in white, and the lifts will be running at nearby Stowe Mountain Resort. Whether you’re a first-time skier or snowboarder, or you just can’t wait to hit the slopes every year, we’ve got some tips for making your winter trip go smoothly so you can focus on having fun! BONUS: As parents with years of experience getting kids to love sliding down snowy mountainsides, we are also sharing some of our favorite family-friendly insider info! Once you have your dates, accommodations, and travel set it’s a great idea to plan some other items in advance so when you get here you can get straight to the fun part! Plan ahead to save some dough! To save on lift tickets, it’s best to purchase them ahead of time through the Stowe Mountain Resort website. If you are only planning on a few days of skiing or riding, purchase day passes at least 7 days in advance for the best price! If your days-on-snow aspirations are bigger than a weekend, consider buying an Epic Pass (good for all Vail resorts). Passes can be purchased for the entire season, and 4 and 7-day options are available as well. A local Epic Pass is also available this year! The savings are steep. Check out this FAQ page to figure out what works best for you. If you’re interested in the Epic Pass, don’t dawdle: The deadline to purchase is November 18, 2018! If you don’t own your own equipment, or if you just want to avoid packing up heavy gear for your journey, renting is a great option. 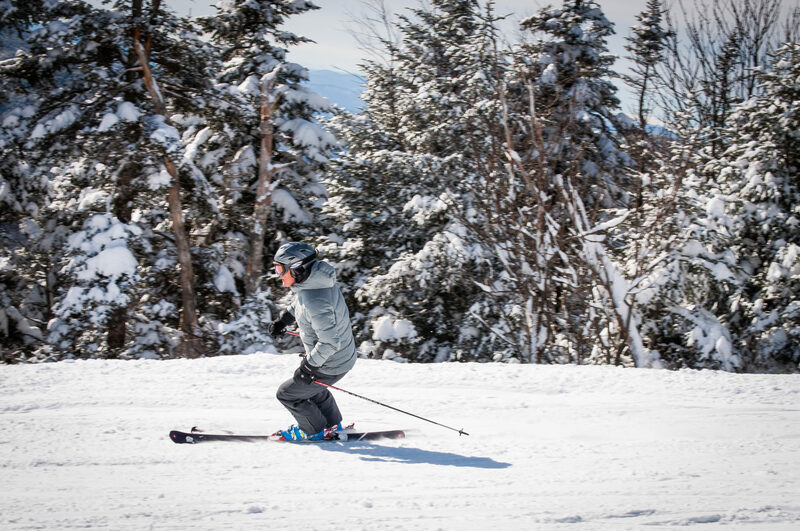 We recommend AJ’s Ski & Sports in Stowe. Friendly staff will get you fitted with ski or snowboard equipment, and you receive a discount if you reserve online in advance! Speaking of planning on saving: Check out our Epic Winter Special and book early for the absolute best prices on accommodations. Snow sports require a lot of gear. Not sure if you’re ready to invest – or maybe your kids are just growing too fast? A great alternative to purchasing is to rent. Kit Lender allows you to rent gear and/or clothing for a few days, and they even ship it for free to your destination. No packing OR commitment required! Getting your kids on the slopes is a really great way to be outside in the winter and have some serious fun. Most kids (our own included) take to snow sports readily and can’t wait to get back out there. Avoid peak times to start your day. The busiest time on the mountain is between 9 AM and noon, so plan on getting there bright and early or make it a lazy morning and head out after a late breakfast or early lunch. Download the Epicmix app and access tons of information that can help you plan your day! Bring your own lunch! Pack some familiar favorites so tired and hungry kids don’t have to wait in line for food. It’s also helpful to avoid peak lunch times when the lodges get a bit crowded. Use the Mountain Road Shuttle to get to and from the mountain. Door-to-door service is a big plus when carrying equipment and trying to keep everyone together. Make time for après ski and relaxation as well as some family time off the mountain! Bowl a few frames at Stowe Bowl or relax sore muscles with a dip in our pool and hot tub. Book accommodations that allow you to have some comfortable downtime and prepare food so you don’t have to go out for all of your meals. Our Deluxe Suite offers maximum flexibility for meals and comfort. Prepare for the right transportation for roads that may be snowy; winter tires and four-wheel drive are highly recommended for traveling to the mountains. Questions about planning a great winter getaway? Give us a call at 802-253-7159. Our experienced staff is happy to answer any of your questions and help you put together a great ski vacation!